Nobody's sharper than Marko the Pencil when it comes to helping students learn to read for meaning and prepare for tests. His tips are super effective and his outrageous antics keep students on task. With Marko's guidance, students ace a practice test by learning how to read passages, find key words, and determine the best answers. Students stay calm and relaxed knowing they have the tools they need to succeed! Approx. 46 min. Ease test-taking stress with a workbook that offers authentic assessment practice and a digital component that appeals to twenty-first century learners. Spectrum® Test Practice for grade 1 prepares kids for math and language arts success by simulating the test experience and applying blended learning—an effective strategy that uses technology to help kids master essential concepts. Help your child hit new heights in test-taking with Spectrum Test Practice for grade 1. Aligned to current state standards, this workbook gets kids ready using practice tests, online exercises, tips, examples, and answer sheets similar to real math and language arts assessments. By providing an authentic test experience, you're helping your child build the skills and confidence to exceed assessment expectations. Spectrum Test Practice provides everything kids need to take on testing—including online practice pages, customized by state and grade level. Ease test-taking stress with a workbook that offers authentic assessment practice and a digital component that appeals to twenty-first century learners. Spectrum® Test Practice for grade 2 prepares kids for math and language arts success by simulating the test experience and applying blended learning—an effective strategy that uses technology to help kids master essential concepts. Help your child hit new heights in test-taking with Spectrum Test Practice for grade 2. Aligned to current state standards, this workbook gets kids ready using practice tests, online exercises, tips, examples, and answer sheets similar to real math and language arts assessments. Ease test-taking stress with a workbook that offers authentic assessment practice and a digital component that appeals to twenty-first century learners. Spectrum® Test Practice for grade 3 prepares kids for math and language arts success by simulating the test experience and applying blended learning—an effective strategy that uses technology to help kids master essential concepts. Help your child hit new heights in test-taking with Spectrum Test Practice for grade 3. Aligned to current state standards, this workbook gets kids ready using practice tests, online exercises, tips, examples, and answer sheets similar to real math and language arts assessments. Ease test-taking stress with a workbook that offers authentic assessment practice and a digital component that appeals to twenty-first century learners. Spectrum® Test Practice for grade 4 prepares kids for math and language arts success by simulating the test experience and applying blended learning—an effective strategy that uses technology to help kids master essential concepts. Help your child hit new heights in test-taking with Spectrum Test Practice for grade 4. Aligned to current state standards, this workbook gets kids ready using practice tests, online exercises, tips, examples, and answer sheets similar to real math and language arts assessments. Ease test-taking stress with a workbook that offers authentic assessment practice and a digital component that appeals to twenty-first century learners. Spectrum® Test Practice for grade 5 prepares kids for math and language arts success by simulating the test experience and applying blended learning—an effective strategy that uses technology to help kids master essential concepts. 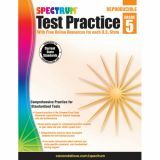 Help your child hit new heights in test-taking with Spectrum Test Practice for grade 5. Aligned to current state standards, this workbook gets kids ready using practice tests, online exercises, tips, examples, and answer sheets similar to real math and language arts assessments. Ease test-taking stress with a workbook that offers authentic assessment practice and a digital component that appeals to twenty-first century learners. Spectrum® Test Practice for grade 6 prepares kids for math and language arts success by simulating the test experience and applying blended learning—an effective strategy that uses technology to help kids master essential concepts. Help your child hit new heights in test-taking with Spectrum Test Practice for grade 6. Aligned to current state standards, this workbook gets kids ready using practice tests, online exercises, tips, examples, and answer sheets similar to real math and language arts assessments. Ease test-taking stress with a workbook that offers authentic assessment practice and a digital component that appeals to twenty-first century learners. Spectrum® Test Practice for grade 7 prepares kids for math and language arts success by simulating the test experience and applying blended learning—an effective strategy that uses technology to help kids master essential concepts. 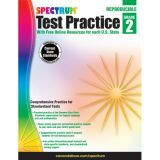 Help your child hit new heights in test-taking with Spectrum Test Practice for grade 7. Aligned to current state standards, this workbook gets kids ready using practice tests, online exercises, tips, examples, and answer sheets similar to real math and language arts assessments. Ease test-taking stress with a workbook that offers authentic assessment practice and a digital component that appeals to twenty-first century learners. Spectrum® Test Practice for grade 8 prepares kids for math and language arts success by simulating the test experience and applying blended learning—an effective strategy that uses technology to help kids master essential concepts. 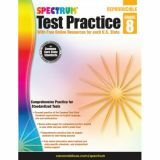 Help your child hit new heights in test-taking with Spectrum Test Practice for grade 8. Aligned to current state standards, this workbook gets kids ready using practice tests, online exercises, tips, examples, and answer sheets similar to real math and language arts assessments. Increase test success with rigorous practice and strategic tips. 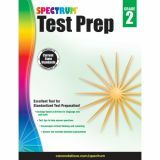 Build your child's confidence and the skills needed to conquer standardized tests with Spectrum® Test Prep for grade 2. This comprehensive workbook goes beyond typical skill drills to explore other contributors to test success—strategies and time management. Spectrum Test Prep Grade 2 includes strategy-based activities for language arts and math, test tips to help answer questions, and critical thinking and reasoning. 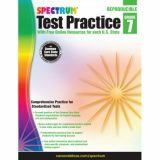 The Spectrum Test Prep series for grades 1 to 8 was developed by experts in education and was created to help students improve and strengthen their test-taking skills. 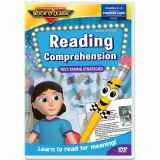 The activities in each book not only feature essential practice in reading, math, and language arts test areas, but also prepare students to take standardized tests. Students learn how to follow directions, understand different test formats, use effective strategies to avoid common mistakes, and budget their time wisely. Step-by-step solutions in the answer key are included. These comprehensive workbooks are an excellent resource for developing skills for assessment success. Spectrum, the best-selling workbook series, is proud to provide quality educational materials that support your students' learning achievement and success. Increase test success with rigorous practice and strategic tips. Build your child's confidence and the skills needed to conquer standardized tests with Spectrum® Test Prep for grade 3. This comprehensive workbook goes beyond typical skill drills to explore other contributors to test success—strategies and time management. 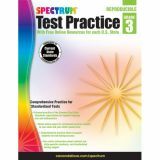 Spectrum Test Prep Grade 3 includes strategy-based activities for language arts and math, test tips to help answer questions, and critical thinking and reasoning. The Spectrum Test Prep series for grades 1 to 8 was developed by experts in education and was created to help students improve and strengthen their test-taking skills. The activities in each book not only feature essential practice in reading, math, and language arts test areas, but also prepare students to take standardized tests. Students learn how to follow directions, understand different test formats, use effective strategies to avoid common mistakes, and budget their time wisely. Increase test success with rigorous practice and strategic tips. Build your child's confidence and the skills needed to conquer standardized tests with Spectrum® Test Prep for grade 4. This comprehensive workbook goes beyond typical skill drills to explore other contributors to test success—strategies and time management. Spectrum Test Prep Grade 4 includes strategy-based activities for language arts and math, test tips to help answer questions, and critical thinking and reasoning. 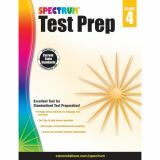 The Spectrum Test Prep series for grades 1 to 8 was developed by experts in education and was created to help students improve and strengthen their test-taking skills. The activities in each book not only feature essential practice in reading, math, and language arts test areas, but also prepare students to take standardized tests. Students learn how to follow directions, understand different test formats, use effective strategies to avoid common mistakes, and budget their time wisely.